500 South Main Street (La Cima Mall). “WinterScapes”, Arts Alive Gallery, 500 S. Main St., LaCima Mall, Breckenridge. Local Co-Op Gallery celebrates winter with a new show featuring winter scenes from local artists. The prices in Summit County reflect a significant decrease: The Median Single Family average price YTD vs. 2009 Full Year is 11% down, the Median Multi-Family average price is 10% down and the Median Residential Land Price is 41% down. March 2010 is flat with monetary volume to March 2009. The most active price points in Summit County in March continue to be in the the$300K-$500K price range with 31% of the Residential Improved Unit percentage gross in March. March was slow for $1M and over Residential Improved Unit transaction movement. Fuqua Livery Stable, 110 East Washington Ave.
Go green and sew your own reusable tote bag using our collection of material. No sewing experience necessary. Tour the Edwin Carter Museum (located at the corner of Wellington Rd and Ridge St) from 11am – 3pm. Tour the Barney Ford House Museum (111 East Washington Ave) from 11am – 3pm. Enjoy live music, $1 per minute chair massage, and $5 glasses of wine. The Tin Shop welcomes guest artist Suzanne Jenne from Larkspur, CO! Stop by the Tin Shop while she is living and working there and see what nature inspired painting is in progress! Learn the basics of oil painting with Amy Evans. Adults only on Monday nights, please. BodyPump 6:15am & 7:45am; Cardio Kickbox 9am; Nia 11am; Yoga 12pm; Cycling 12pm; Tae Kwon Do 4:15am; Cycling 5:30pm; BodyPump 5:30pm; Basic Yoga 6:15pm. 5:00 pm Breckenridge Resort Chamber Ambassadors April Mixer! Join us for drinks and snacks at the April Mixer! Brought to you by Bubba Gumps and the Breckenridge ski Resort Chamber Ambassadors! Experiment with Tie Dying T-Shirts! Rocky Mountain Radon collaborates with Extreme Radon solidifying us as Colorado’s premier Radon mitigation company. We provide the latest in testing technology, unparalleled experience, and a proven history of exemplary work in our community spanning the last 18 years. With our experience and ability to perform radon sample testing in house we are able to save you money by being efficient and cutting out the middle man. We are a locally owned and operated company on the Front Range with over 18 years of experience in radon gas testing and mitigation. We have installed over 10,000 mitigation systems in Colorado property and have become part of the community promoting healthy living and safety. Our company may pride itself in unsurpassed innovation and implementing only the newest of technologies but we built our company on customer satisfaction and that is still our most important goal today. Located at the foot of the Rocky Mountains, we know clean, healthy air and want to help keep your family safe. .You can be assured of quick, accurate test results enabling you to have safer air – faster. We are proud to partner with the American Lung Association – working together in the prevention of lung cancer! Schedule today and see why we are # 1. Learn the basics of throwing and hand-building. Class will meet every Thursday through April 8. $100 includes all materials. Renew Colorado Ski Pass for just $49 down, pay the guaranteed lowest price of the season, plus receive spring benefits. Buy your Season Pass this spring or summer to get summer 2010 lift access (does not include bike haul)*. New Colorado Passes must be purchased in person at one of our retail locations listed below. Learn more at ColoradoPass.com. Purchase and pick up your season pass Friday-Sunday during store hours. • Only $49 Down: Put only $49 down now to lock in these great prices and the balance gets charged in September 2010. • Four (4) $59 lift tickets (Colorado Pass and Summit Pass only). Almost 50% off. • Unlimited April Skiing and Riding: (Colorado Pass only). Unlimited skiing and riding for April 2011 at Vail and Beaver Creek. • Summer 2010 Lift Access (does not include bike haul)*. Visit ColoradoPass.com for more information. Prices only guaranteed through May 31, 2010. As a 2010/11 Season Pass holder, you’ll enjoy immediate summer lift access benefits, beginning this summer (2010). Previously, summer benefits were applied to the summer following the Breckenridge ski season, versus the summer before the ski season. Starting this year, immediate summer benefits will apply to passes purchased this spring or summer, including the Epic Pass, Epic 7-Pack, Colorado Pass, Summit Pass and Keystone/Arapahoe Basin Pass. If you are a new pass holder, your summer benefits will already apply to this summer! If you are a renewing pass holder, we’ll continue to honor last year’s summer benefits policy throughout the duration of this summer (2010). Please make a note that summer 2011 benefits will apply only to those passes purchased next spring. This season, experience the freedom of four full-day lessons with the Keystone Ski & Ride School for only $249. Also added is the convenience of four complimentary days of Mountain House slopeside parking, just a short walk to the Ski & Ride School lifts. It’s that easy and you save over $500. However quantities are limited so buy now. It’s all here at Keystone this winter. Price is guaranteed only through May 9, 2010. • Keystone Ski & Ride School only product, lift tickets not included. • Available to season pass holders for purchase at any Front Range sales location or by calling 800-255-3715. • Reservations required at least 48 hours in advance. • Available to skiers age 3 and older and snowboarders age 7 and older. • Restricted 12/4/10, 12/20/10-1/2/11, 1/8/11, 2/5/11, 2/19/11-2/21/11, 3/12/11-3/20/11. For more information, call 800-255-3715 or visit KeystoneResort.com. Keystone Resort holds the right to limit the total number of sales. Family Freedom Pack and Adult Lesson Pass are non-transferable, non-refundable, price subject to change. ©2010 Vail Resorts Management Company. All rights reserved. Designated trademarks property of Vail Trademarks, Inc. The Keystone Adult Lesson Pass allows you to take group lessons with Keystone Ski & Ride School Thursdays through Sundays throughout the 2010/11 season for only $249. 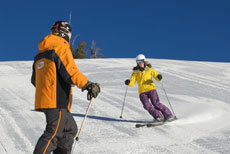 • Keystone Ski & Ride School only product, lessons are non-transferable, lift tickets not included. • Participants may redeem one lesson per day on the morning of the lesson. • Offer only available to season pass holders age 14 and older. • Restricted 12/23/10-1/2/11, 1/13/11-1/16/11, 2/17/11-2/20/11, 3/12/11-3/20/11. The Breckenridge Lesson Pass allows you to take lessons with the Breckenridge Ski & Ride School Thursdays through Sundays throughout the 2010/11 Season. Spring sales through May 9th, 2010 or while supplies last. • Available to season pass holders for purchase at any Front Range sales location or by calling 888-576-2754. • Adult Lesson Pass valid for ages 14 and older for Ski, Snowboard and Tele Saturday class lessons. • Child Lesson Pass valid for ages 4-13 for Ski and Snowboard class lessons. • Participants may redeem one Ski & Ride School group lesson ticket per day on the morning of the lesson. The Lesson Passes are valid for classes Thursday through Sunday only. The lesson ticket is NOT TRANSFERABLE. You must have your season pass present to obtain a lesson ticket. • Lessons meet at normal class lesson times; 9:45am for Adults and 9:15am for children, for morning and all day lessons. Afternoon lessons are only available to novice skiers and riders, levels 1-4, and depart at 1:30pm. • Not valid for Ultimate 4, Adventure Session, camp or special program participation. • Restricted: 12/23/10-01/02/11, 1/08/11-1/09/11, 1/15/11-1/16/11, 2/19/11-2/20/11, 3/12/11-03/20/11. 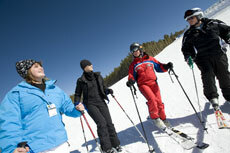 For more information, call 888-576-2754 or visit Breckenridge.com. All dates/times/locations subject to change. Sales while supplies last. ©2010 Vail Resorts Management Company. All rights reserved. Designated trademarks property of Vail Trademarks, Inc.